Mothers day is a day to be enjoyed. 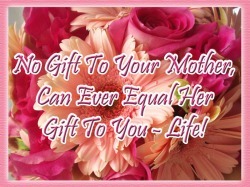 Choose to enjoy Mothers day instead of feeling guilty. Choose to make it a great despite the botched gifts, the screaming kids, the forgetful husband, or even the burnt dinner. Choose to make it a wonderful day for it is truly YOUR DAY.